Many of us couldn’t make it through a day without a cup or two of our favorite caffeinated beverage. I usually start my day with a warm cup of coffee or tea. In fact, more than 50% of adults in America drink coffee on a daily basis, averaging about 3 cups a day. In the US, $40 billion is spent on coffee each year. But in the lab, coffee is good for more than just drinking; it can be used to make nanoparticles too! Enjoying a cup of coffee in my pirate mug! One way to make nanoparticles in the lab is to transform metal ions into metal atoms. Metal ions are atoms that carry a positive charge, while “regular” atoms have no charge. The chemicals that are able to carry out this transformation are known as “reductants”. After the reductants perform this feat of chemical wonder, tens to hundreds of metal atoms group together into what we know as a nanoparticle. Typical reductants include chemicals known as sodium borohydride and ethylene glycol. However, there are downsides to these reductants. Sodium borohydride is highly corrosive and ethylene glycol requires high temperatures. Additionally, chemists have to add extra chemical stabilizers that coat the surface of the nanoparticles to prevent them from clustering together. Coffee is an inexpensive, green alternative to conventional reductants. 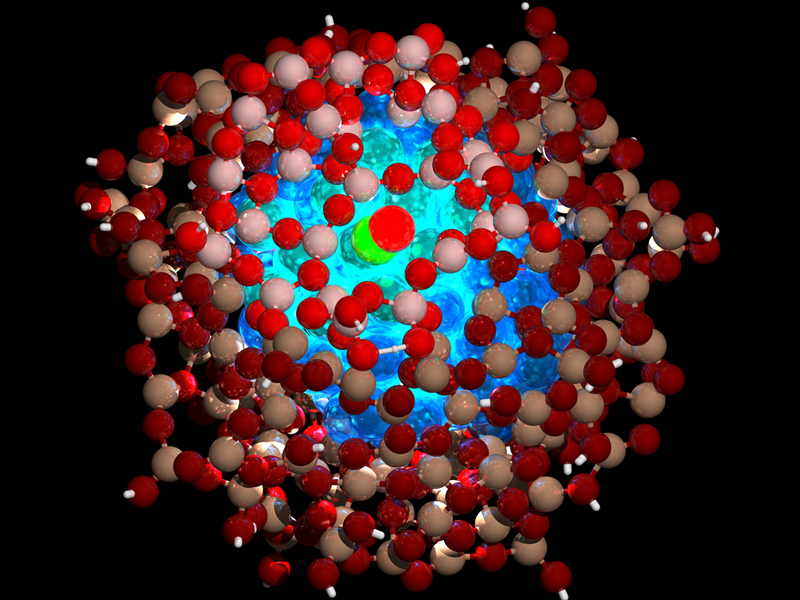 An atomic-level representation of a coated nanoparticle. The blue on the inside is the core of the nanoparticle and the red spheres are the protective coating. Image source. 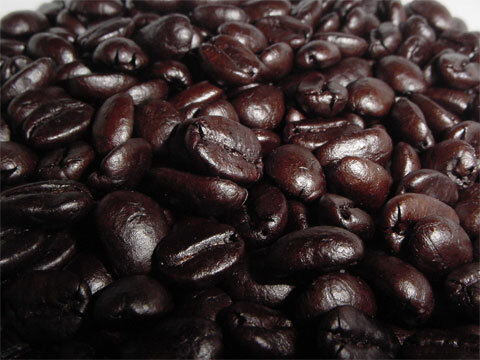 Coffee beans are seeds of coffea plants, which contain many different chemicals. The class of chemicals found in coffee that are believed to act as the reductant are called polyphenols (large groups of carbon rings with alchohol groups). Polyphenols are a type of antioxidant, a type of chemical found in many food products. Another antioxidant found in many foods is asorbic acid or vitamin C. The presence of antioxidants (either polyphenols or asorbic acid) allows coffee, tea, and various juices to reduce metal ions to form metal nanoparticles. So, reductants are pretty much the same thing as antioxidants. In Dr. Kevin Metz’s lab at Albion College, I have made silver and palladium nanoparticles using coffee. 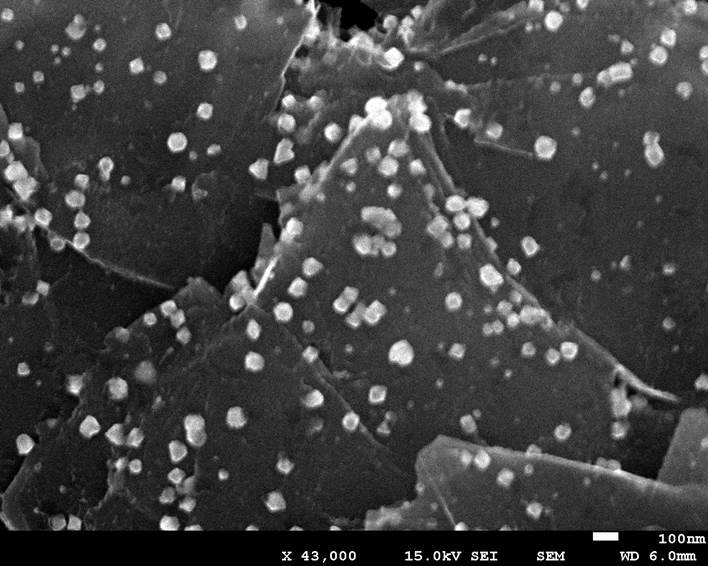 Palladium nanoparticles scattered on the surface of graphite. These nanoparticles were made using coffee! This image was acquired using a scanning electron microscope. Using coffee as a reductant has advantages over using traditional reductants. First, you can buy instant coffee at your local grocery store for less than $10. Coffee is also much safer to work with than corrosive reductants like sodium borohydride. Additionally, the polyphenols found in coffee are strong enough reducing agents to work at room temperature, thus saving energy. Finally, additional stabilizers do not need to be added in the synthesis as the polyphenols and other chemicals in coffee prevent the nanoparticles from sticking together. However, there are disadvantages to using coffee as well. The nanoparticles synthesized with coffee are usually around 50 nanometers in size, which is fairly large on the nanoscale. Additionally, the nanoparticles end up covered with a large variety of complex coffee-derived chemicals, making it difficult to understand the exact composition of the nanoparticles. Coffee and other antioxidant rich beverages are green alternatives for nanoparticle synthesis. These beverages are regularly consumed by people all over the world, and their use in chemical reactions causes minimal harm to us or the environment. But the best thing about making nanoparticles with coffee is that the lab smells great! Citizen nanoscientists: Can you design nanomaterials from the couch? Great Job – article is very interesting – graphics excellent – is the project patentable? What practical applications if any are possible? Keep up the good work! Thanks John! I’m not patent expert, but I believe that once a method has been disclosed to the public in the form of a publication (or blog post for that matter), the idea is not longer patentable. It’s not 100% clear to me how scale-able this method would be… how polyphenol plant extract price would compare to the price of some other reductant… that would probably be one of the main limiting factors in terms of industrial applications. So for now the main practical application is allowing lab-scale researchers to prepare nanoparticles using less hazardous chemicals. Thanks for the questions! Keep ’em coming! Just happened to stumbled upon Sustainable Nano by following a link. I have to say great job with the website! Very interesting content (I mean hey it’s nano)! Whatever led you to try coffee as a reducing agent? Again to everyone at Sustainable Nano and the Center for Sustainable Nanotechnology two thumbs up! It is awesome to see inter-university collaboration and a truly active outreach website. Thank you! Thanks for your enthusiasm!! We’re psyched you like the site! As for why we tried coffee, the procedure comes from this literature article: http://dx.doi.org/10.1039/B804703K It’s a great and super safe way to make these particles! As for why coffee/tea occurred to them, it seems to have been out of a desire to combine the reducing agent with the coating agent, so that fewer things were necessary for the reaction. But that is just what they say in the paper… who knows why coffee popped into their heads!? !